Have you ever watched someone on a design/remodeling show do something that you thought would be terribly difficult, but they made it look so easy (or very doable, at least) that you thought to yourself, “I could totally do that!” And then when you’re actually doing the project, you’re cursing the aforementioned t.v. personality the whole time for making you think it would be fairly easy? Yeah. Me too. Yesterday. You may have noticed that I had some hardwood floor boards missing in my hallway. That’s because the builders of this house framed in the hallway closet before installing the hardwood floor. Naturally. That’s the way all builders do it. All framing is done long before flooring is installed. And then when I moved the door over, I exposed even more subfloor along the threshold that needed to be patched with hardwood flooring. I’ve been dreading this project more than any other, because it seemed so daunting to me. But I thought, “This is no problem! 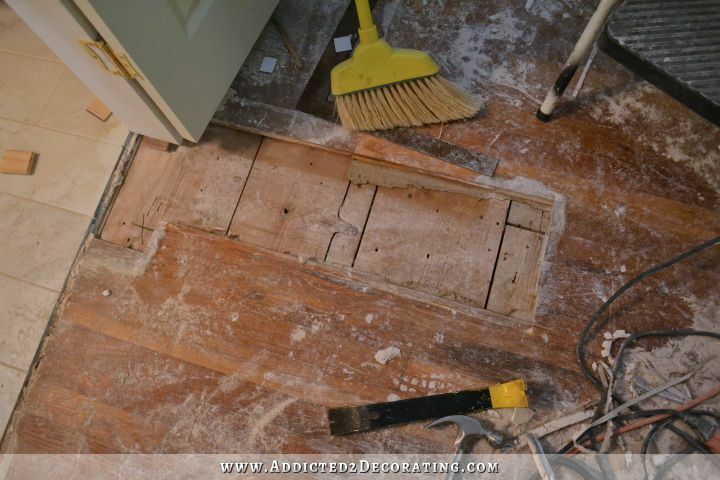 I can totally do this because I’ve seen Nicole Curtis and her team do this a hundred times!” And I had saved all of the old floor boards that I removed from the old linen closet, so I could patch it with original flooring. This is so doable, right? So I cut and installed the first board. Things were off to a rocky start because no matter how much I tried, or what I tried, I couldn’t get the gap between the ends of the new and old boards to close. Whatever. I gave up and moved on to the second board. And here’s where my brilliance kicked into high gear. I knew I needed the boards to be staggered to look natural. So I used my Dremel Multi-Max saw to cut into the original board so that the new board could be staggered. Brilliant, right? It actually worked out beautifully. It’s just too bad that every ounce of my brilliance was used up on installing that second board, because I clearly had none left when I got to the fourth board. Ugh. By that time I was so frustrated because the boards just weren’t cooperating, they weren’t fitting together, and the fourth and final board needed to be cut down so that it would even fit. I knew I would have to use my table saw to cut the tongue off of the board, but I also had to cut some of the width off, as well as slightly miter the edge so that it would fit in there. So in all of that, I completely forgot to stagger the ends. And the whole thing just looked like a big mess with awful gaps all all over. Ugh. But there was no turning back at this point, so I pressed on. I used my Dremel Multi-Max to remove all of the extra junk (concrete board, dried thinset mortar) from the edge of the tile. Once that was all cleaned up, I had a fairly straight line to work with on the tile. 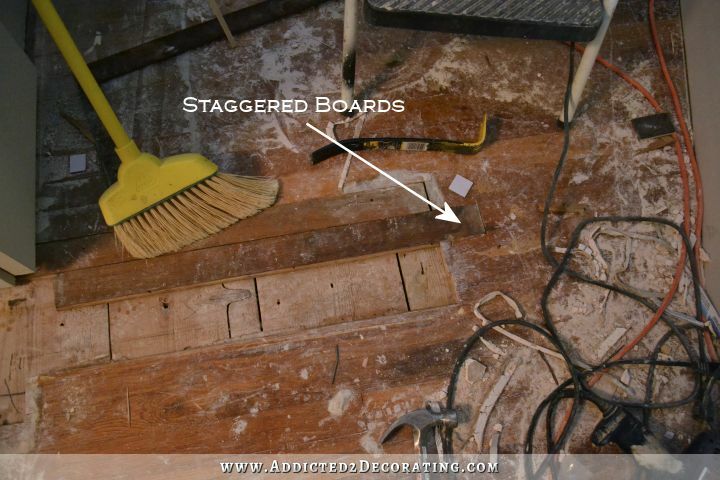 Then I used another floor board that I was going to use as the transition board, and marked a cut line along the hardwood floor. And once again, I used my Dremel Multi-Max to cut those boards straight. Then I added my transition board. My obvious mistake here is that all of this should have been done before installing the doors. Oh well. There’s no going back now, and there’s certainly no way I was going to remove those doors after I got them lined up and opening/closing so perfectly. Also, none of the original boards that I pulled out of the linen closet were wide enough for the transition strip, so I had to use one of the new flooring boards left over from the kitchen. And as I learned from my kitchen, even though this is all red oak, the new boards and old boards don’t look the same with Waterlox on them. That one new wood board will have to be stained in order to blend in with the old hardwood floor. So at this point, I’d love to just give up on making this look nice (and possibly send a sharply-worded e-mail to Nicole Curtis for making me think this would be easy!) 😀 But of course, giving up isn’t an option. I don’t know that looking “good” or “beautiful” is even within reach for this patched floor at this point, but I’m determined to make this look decent, at least. It’s a pretty low bar when “not glaringly obvious” becomes the goal. After seeing all of those gaps in the finished product yesterday, I got online immediately and ordered some red oak hardwood floor wood filler. It should be here later this week, and I’m hoping that it’ll work a miracle on this flooring. 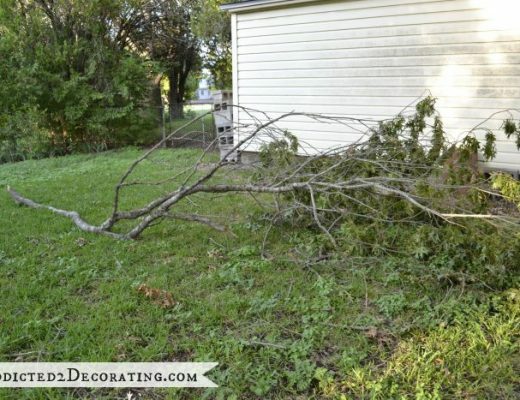 You Want To Charge Me HOW MUCH To Trim My Trees?!?! In all honesty, I don’t know that normal people would notice that two boards don’t have staggered ends. And even if they do, it’s not like it’s 7 boards in a row. I really think it will look just fine in the end. Even though you may have a hard time outside the bathroom, I keep looking at the beautiful floor tile IN THE BATHROOM!!!! 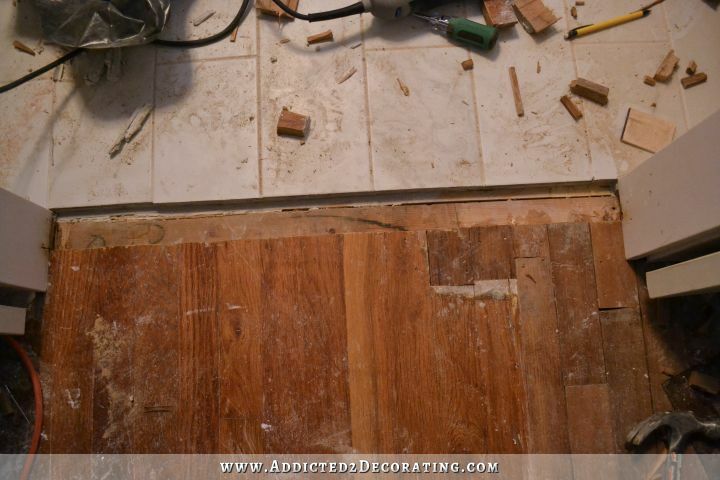 First, its amazing to me that you even attempted this fix as daunting a task as it is to patch old hardwood floors! If only it was that easy to throw down a hallway runner. Not sure if that would be good with Matt using a wheelchair. One thing I do know is Kristi will figure it out and show us a great end product! 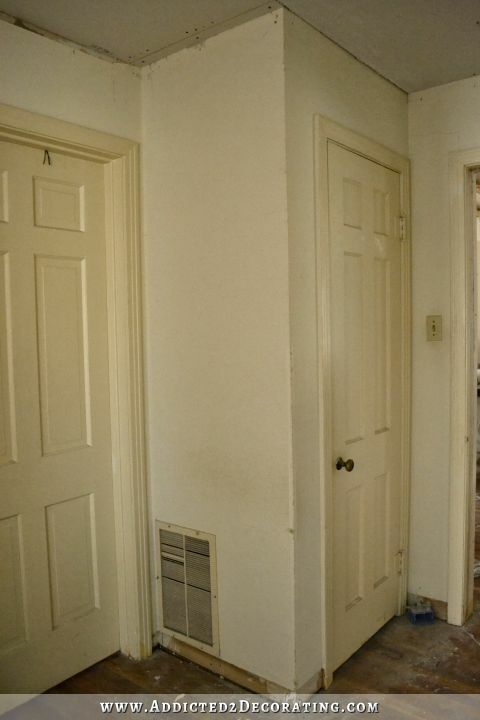 Maybe you could do a little trompe l’oeil with some stain and those boards. Make one section spanning the seam of one of those boards a little darker than the other. Although, I’m sure you’re the only one it will ever bother! Who wants to look at your floor when you have that beautiful kitchen to gawk at! Keep it up, you inspire me to take on bigger projects in my own house facelift! I know you have made comments that you don’t use rugs because they are in the way for Matt but what about a faux rug, painted on the floor? If it were my floor and I couldn’t make it look good (which of course means not noticeably patched) I would consider a painting on the floor. I’ve seen some beautiful ones and I’m sure you good pull it off. If you hadn’t pointed this out, and if I hadn’t seen it blown up on my computer screen 4 inches from my face, I would have not even noticed. I hope that once you get the stain on the threshold, it will look much better to you. Hope your painting today is less frustrating. I’m really excited to see the teal vanity! There’s always the possibility of a well-placed “door mat” sized rug to welcome you into the bathroom area! (Or not) Seriously, though, what about using a slightly darker stain there to create a “doormat” stenciled pattern? Stenciled rug..what a genius idea 🙂 Kristi…you always do a great job no matter what! 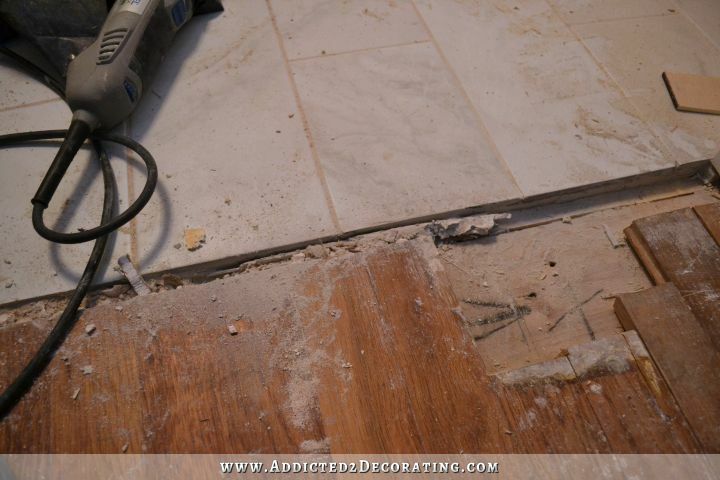 White marble doesn’t match my tile floor. I don’t want three very different flooring materials in such a small space. You know doll….we are all in amazement at you doing this anyway! Patching is never easy…….so I think you’ve done a fabulous job….and look at it this way….we have ALL learned from you to do it before we install a new door……so as always……you’re experience and know.edge is something passed on and treasured!….plus RESPECTED!!!!!! 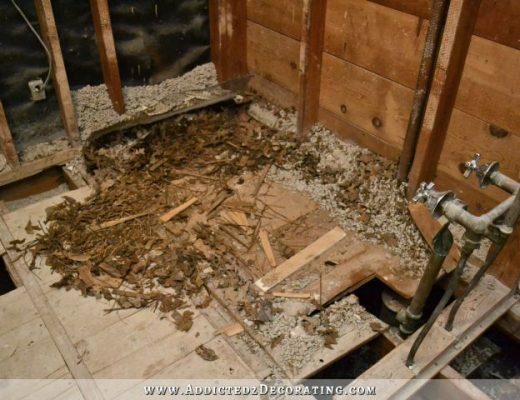 Thank again……job well done and accomplished…….can not wait to see this beautiful bathroom! I believe it will be unnoticeable to anyone but Kristi. Fill, sand, stain, and seal. Move on!!! But we all know that Kristie will rip it all out. Less than her perfect………….. I agree with the others. Once this is sanded and stained, I doubt anyone notices! Plus the door will semi-cover it up as it opens and closes. You did good. And, I bet when Nicole started it wasn’t as easy as she makes it look. But, after you do something over and over, it gets easier. Now you are a pro! Nicole Curtis has the benefit of lots of behind the scene workers and editing to make her look good. You, Kristi, are My Hero! I was going to suggest wood filler as I had to use it to fill a gap that was left when we installed the tile in our bath. 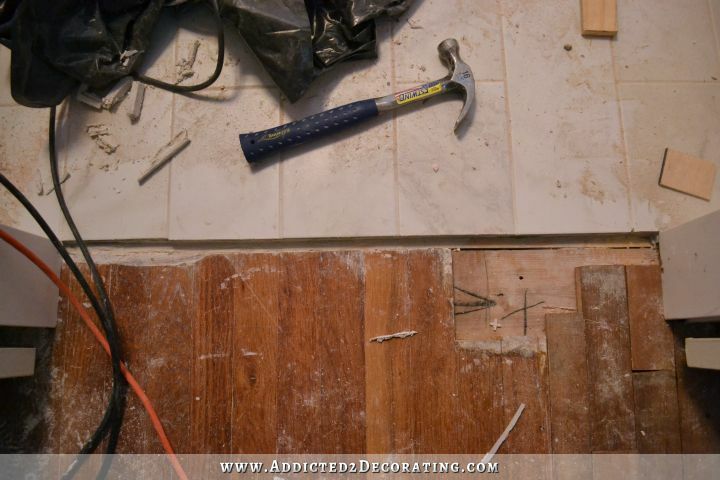 There was a tiny gap between the hardwoods and the tile, even with the threshold put down. It worked like a charm and has held up for several years. I feel your pain. But, in the end, I think the only person who will notice it is you. Like that one tile in the bathroom. Love those well-meaning DIY shows. They have caused so much angst for the first time DIY-ers, (and danger! ) and frustrated the folks who are seasoned at DIY but not pros yet! Kind of like Pintrest fails! They fail to point out that the host/hostess did 25 takes of a 2 minute demo! But I don’t think anyone else will pay attention to a flaw here and there. As others have said, they will be seeing the gorgeous bath redo! In all my dreaming and pinning on Pinterest I’ve seen decorative tiles put in a transition spot. So that’s an idea. WHAT discrepancy in the floor???? It’s an old house, a few wrinkles and imperfections are to be expected and just add to the charm. As the others have said, anyone who sees it will be looking at the beautiful bathroom anyway. I haven’t laughed this hard in a long time! poor Nicole Curtis! LOL I don’t think the question here is whether or not guests will notice it. It’s whether or not the floor patch stares Kristi in the face every time she comes near the bathroom! We did the same in our old house. The wood filler makes a world of difference. You can do it Kristi!!!!! I’ve been reading and loving your blog for months, but this is the first time I’ve left a comment. As for the floor, my great grandmother would have said, “It will never be seen on a galloping horse.” In defense of Nicole Curtis, the drapes you inspired me to make took two weeks to complete instead of the two days it took you. I don’t know how you get so much done in a day. Good job. It will be fine. If you decide to leave it, that can be your little “can they be my friend” secret test. Because if someone goes to your home and ignores all of the truly amazing things you’ve done and instead fixates on four floorboards… I’m convinced there is only meanness in their hearts! As many of your other fans have pointed out, we respect you for your bold decisions, inspiring skills, and willingness to share your failures as well as the wins. While we love being on this journey with you, don’t ever forget that you’re designing this house to please yourself and Matt! See the positive…..you did it, it’s not perfect and it has character…..love it! I think you are doing great work and even if it does look a little off, I bet no one will notice unless you point it out to them. As far as Nicole Curtis, I absolutely refuse to watch Rehab Addict because I can’t stand her voice. It’s like nails on a chalkboard. Whenever one of her commercials comes on, I have to mute the TV. Plus her bubbly, over-the-top personality just gets on my nerves. If you can remember, you will often hear Nicole say “it’s not perfect, and it’s never going to be perfect”. You are dealing with an old house, and you just have to learn to embrace the imperfections and love the character of your old home. 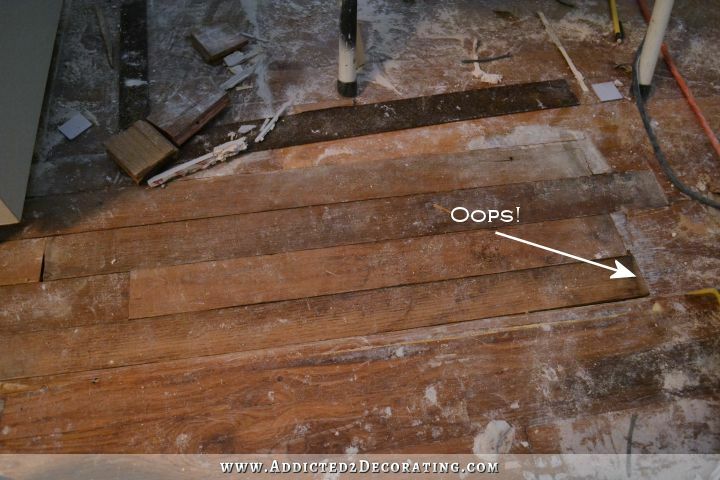 Hopefully nobody will spend time staring at that section of the floor to even notice the oops. 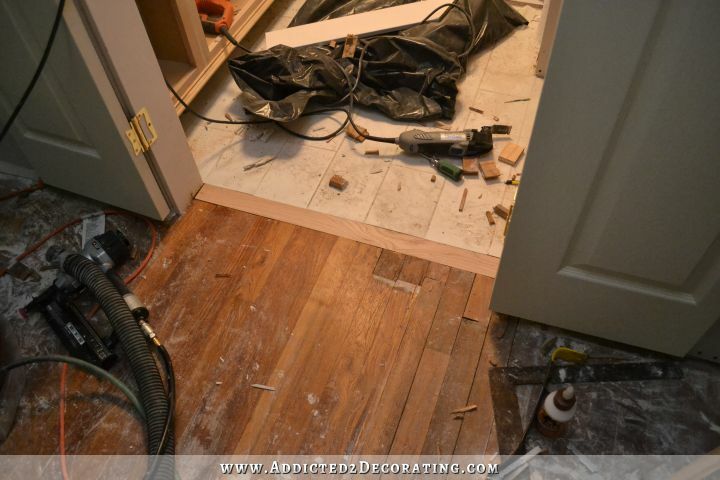 As my husband says, the only place the finishes have to be perfect is in front of the commode! That’s the only place you really sit and study things. LOL. Keep on plugging along. Love where you are going. Just have to say that Nicole Curtis is not a perfectionist her floors or tile jobs are never perfect that just seems to be her style. Yours will be great. Honey you make every project you do look easy and then I try. I never bad mouth you but I do utter some words that shouldn’t be repeated. My husband always quotes Clint Eastwood and says, “A man has to know his limitations”. That’s usually when I smack him. I think it looks pretty damn good. Ha! OMG I had the exact same experience two weeks ago patching my oak floors. I was cursing Nicole Curtis and her perfectly feathered floors!!! Yours came out much better than mine. Our house is almost 100 years old and we needed to patch a couple holes in the woods floor in the living room, where the stream pipes had been removed, before we had the floors refinished. We came up with the brilliant idea to take up a couple boards from the hall closet floor to do the patch with….so smart right? To our dismay, when we could finally get in that room to see the finished result, the patches were a completely different color! Turns out they used a different wood (probably cheaper) in the closet. No one else seems to care, or notice, but it irritates me every time I see it….I feel your pain sister. Staggering is not only about the look, it is about the structural integrity of the floor. I would sort it out Kristi. On the other hand, the tiles in the bathroom don’t compromize the functionality of the floor, which looks beautiful anyway, so I would leave them as they are. I once saw Tommy from This Old House do a trick that involved mixing sawdust with wood glue and then using it as wood filler. If the wood filler you bought online doesn’t work so well or doesn’t color match quite the way you want it to, maybe you could saw-up some scrap wood to generate dust, then use this trick. Yes! I’ve seen that, too! In fact, when I was searching online for hardwood floor wood filler,I came across a dry powder mix that is sawdust mixed with some other fillers. I wasn’t quite brave enough to try it out. I have no doubt that by the time you fill, stain, finish it will be beautiful. You are my Nicole. My husband says, “but Kristi probably didn’t try ________ as her first project.” I’m not showing him that Eastwood “know your limitations” quote. Kristi- I cant find your link to your torn paper wall treatment. Help!!!! 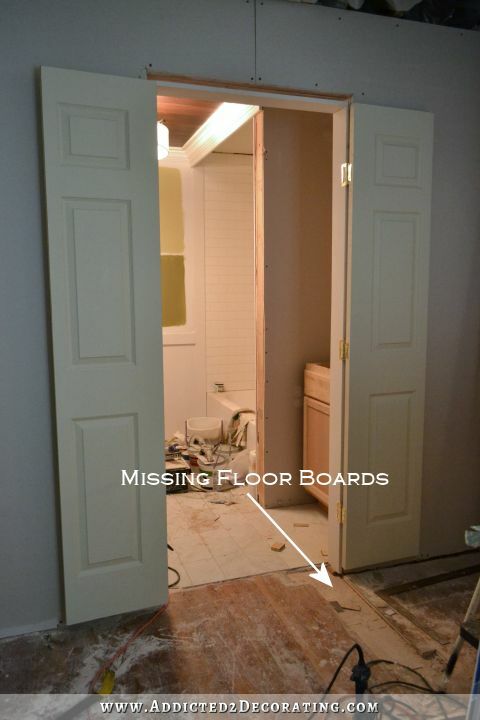 How are the boards attached to the subfloor? nails, glue…? I used wood glue and nails. I have to second what Judy said yesterday, Nicole is not a perfectionist. I think she wears black tank tops too much (and my husband disagrees) but perfectionism never stymied her on any show I have seen. I totally understand! Our dishwasher died and we discovered the old dishwasher had been installed by our house’s previous owners BEFORE the hardwood kitchen floors were installed. So, the dishwasher was boxed in real good with no margin to wiggle it out, or to wiggle the new dishwasher in. So the installers had to cut out some boards. Our carpenter re-installed the boards but it was really difficult to get them back in and also not creaking. Only three boards! It was driving everybody insane. There were also big gaps because of course sawing the boards out took 1/8″ or so of length off each end, enough to make an obvious bigger gap. They filled the gaps with the filler but it looks really obvious and I’m ready to dig the filler out and just have a gap, which might not look as bad as the filler. We have runners in the kitchen partially covering this, so it makes it tolerable to look at. Kristi , as I’m reading this I’m looking over at some unfeathered boards in our old house where the wood floor had to be repaired. I know it’s there but not a single person has even noticed that the boards don’t exactly match, etc. 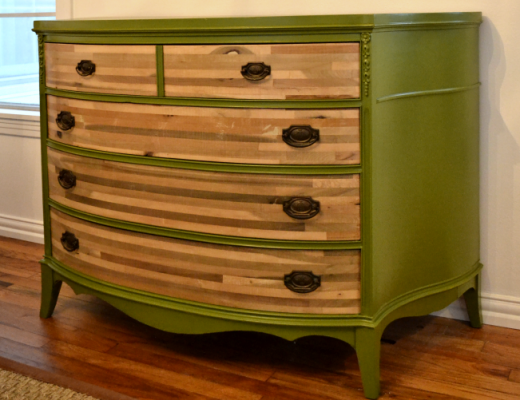 Our guests always seem to be focused on other features of the room as I’m sure they will be in your home. I Had to do the exact same repair last weekend (sub floor / floor boards). It was more difficult than I had hoped, but it sure beat the $150 per hour / per guy (2 men) estimate I got. I also had to cut off the tongue part off and still struggled a bit. In the end I was proud of my work, and thank goodness for a gorgeous $40 rug. I am so grateful for women like you who give us girls the courage to tackle such projects. Remember, Nicole has a huge “team” behind her to assist and get the job done. She is awesome, but has many experienced people to help.